The instructor was an older guy who had some publication credits but wasn’t anyone I recognized then or now. I can’t even remember his name. But I sure as hell remember something he did. During one class, he announced that he’d read a revised story draft of mine, and here was what he thought of it. And he tossed my story in a wastebasket in front of the entire class. He did go on to explain where he thought the revisions (most of which he’d suggested) had gone wrong, but I didn’t hear a word he said because everything inside me had already gone to DEFCON 1. My heart thudded, my blood was trying to escape the top of my head and splatter on the ceiling, and a klaxon of Don’t cry don’t cry don’t cry don’t give him the satisfaction blared in my head. There was no space left in my brain for his insights. I doubt I missed much. He did approach me after that class and kind of apologize and kind of let on that he only did things like that to the students he thought had talent. I didn’t show anyone another word of my fiction for over twenty years. Indeed, I eventually stopped writing for a while. I was really young back then and very easily hurt, and I didn’t see the point in spending time and money just to be humiliated. In 2011 I started writing again in earnest. I won NaNoWriMo several years in a row, and in 2016 I took a deep breath and submitted a piece of flash fiction to the editors of the Weekly Knob, who graciously accepted it. In 2017, I began querying and submitting novels to online mentoring programs. I made it into Pitch Wars, and my mentor Peter McLean was (and is) the polar opposite of the jerkass from Georgetown: he knew how to give badly-needed criticism in a helpful, encouraging way. But by mid-2018, I realized my writing had plateaued. I got several partial and full requests for Tidepool, and stories I sent out were shortlisted in Apex and other publications, but I couldn’t seem to get over that last hurdle to acceptance. I was still on the wrong side of the velvet rope. And I wasn’t going to improve sitting in front of my laptop night after night. Something had to change. I got an email about the Borderlands Press Boot Camp workshop in the spring of 2018. Hm. A weekend in Baltimore working closely with some highly-regarded writers in my preferred genre? This was clearly one of those “It would be stupid not to apply,” situations, so I did. And surprise! I got in. On Friday, January 25, I packed up the 21 manuscripts I’d critiqued (oh, and some clothes and deodorant and other trivial stuff) and headed to Union Station to take a train to Baltimore. I was so nervous I could barely eat. I had no idea what to expect. Attendees from previous years had posted lots of favorable blog reviews, but still. What if someone like the jerk from Georgetown was one of the instructors? What if I was stuck in a group with one of those I am God’s gift to writing and will harangue you about all your writing flaws but get pissy and defensive if you dare mention mine types I remembered all too well from college writing groups? What if? The workshop was held at the Brookshire Suites by the Inner Harbor, and when I got to my room, I realized that “Suites” meant suites. I had a living room and a bedroom. The whole setup was nicer than my first apartment. 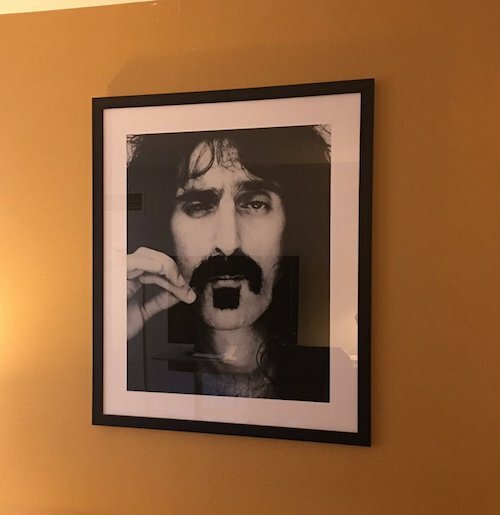 And that apartment didn’t have a big picture of Frank Zappa on the wall either. He looks really thrilled to be spending the weekend with me, doesn’t he? I tried to calm my nerves by telling myself that the intensive critiques didn’t start until Saturday, so I could relax a little for the Friday night opening session. 2. It was clear that most of us didn’t understand how to tell a story. We didn’t know where our stories really began or where they ended or how to end them, and we had trouble forming linear narratives in between. Eesh. I wondered if any of that applied to my submission. “Mara” is a short story about a recovering alcoholic who buys a new smartphone that keeps directing her to bars and trying to get her to drink. It surprised precisely nobody to learn that I’d been watching a lot of “Black Mirror” when I wrote that. As far as I could tell, I’d stuck to a fairly linear narrative with a definitive ending, so maybe I’d be OK.
And then F. Paul Wilson, another instructor, spoke up. Oh crap. At least he remembered my story, right? I swallowed hard and figured he hadn’t been insulting (far from it), and besides, I didn’t spend money and time coming to Baltimore so people would tell me my work was fine. I knew it wasn’t. And this was the part when some experienced writers and editors were going to tell me why.